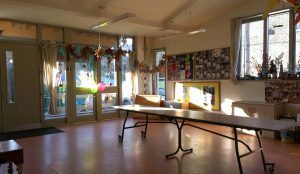 You can hire a room at the farm for evening events & meetings at reasonable rates. We have a large ground floor room with kitchen amenities available which comfortably seats 12 -15 adults. Sometimes the room is also used for daytime children’s art sessions so some of their creations might be on the walls! Evening events have included community group meetings, guitar recitals as well as talks by a local historian. We also welcome community groups & organisations wishing to run training courses, arts & crafts workshops or cultural events. Pay and display parking on Queen’s Crescent & Vicar’s Road .